A journey can be an expedition across land and water or it can be a path through time. 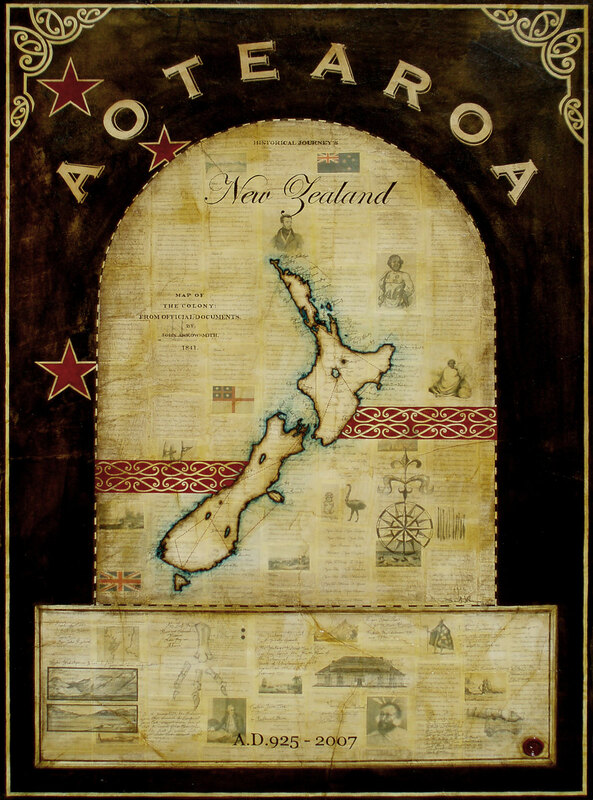 This work is about both; it outlines important historical moments in time for Aotearoa; it is about the physical journeys that the early Maori and European immigrants made along with my research journey I embarked on in January 2007 of which I have marked with the red dotted lines. The Date – A.D.925 – The approximate date that Kupe, the legendary Polynesian explorer first arrived in Aotearoa. – 2007 – The year I embarked on my journey throughout the North and South Islands. The pencil drawings on the lower part are images I saw whilst traveling, they include Waitangi House and the bones of a Moa’s foot among other things.